Clay Hardwick, better known as “ECHOMECH,” is a self-taught painter, recognized for his colorful, organic, abstracted paintings reflecting the natural world. Transcending the objective, his mixed-media paintings explore the rhythm and flow between an urban, neon-lit landscape, with that of the forest-lined mountains and waterways. Growing up in Jackson, Mississippi, Hardwick graduated from Millsaps College, studying Digital Arts in 2009. Refusing to work a 9 to 5, Hardwick pursued a career in freelance video production by day, while exploring painting abstract images by night. He has had success in video and filmmaking, winning dozens of awards in film festivals, been nominated twice for Regional Emmy, Davey and Telly Awards mostly for his work on music videos or documentaries. However, more recently Clay has turned his attention to fine art. 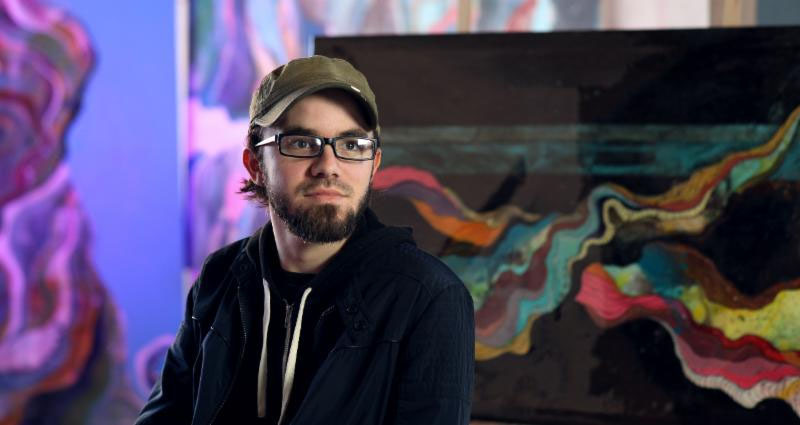 Over just the past two years he has been featured in regional art magazines, exhibited in a metropolitan airport, had three solo shows, and participated in many juried art competitions. Currently living in the lower Appalachian mountains, Hardwick frequents the outdoors and infuses the picturesque environment in his work. He currently paints out of WorkSpace Studios in downtown Chattanooga, TN.